Designed for Qi enabled smartphones, this NEW device provides Triple functionality with (2) TR receptacles, (1) and (1) Wireless inductive charger with cradle. Most of the newest and most popular cell phones from Apple (8,10, 8S, 10S) and Samsung (8,9) now offer this “no cord needed” charging capability. 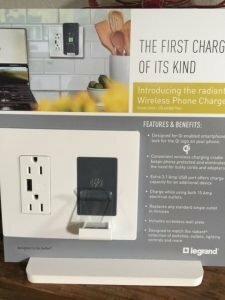 Legrand is first to the market in providing a solution to the unending demand consumers have for charging their devices. This solution is ideal in new construction applications as well as a retrofit solution in any wired single gang outlet in both home and office applications.